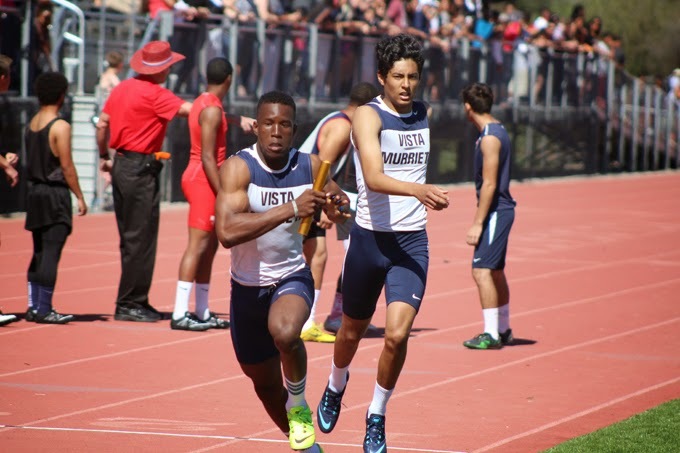 Paul Harrison takes the baton from teammate Jacob Lister in Vista Murrieta's winning effort in the 8x200 relay. 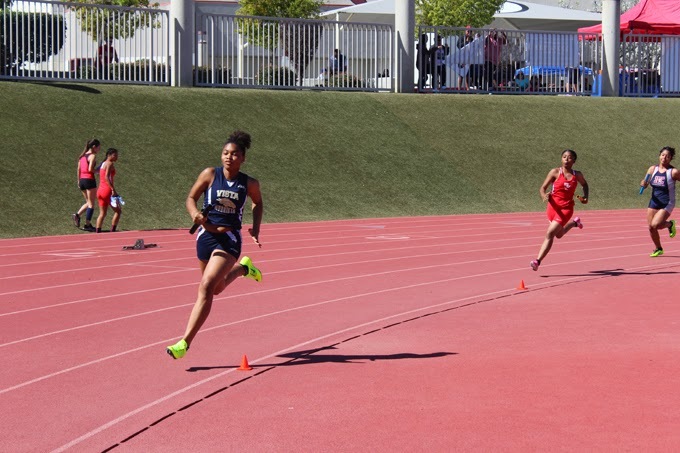 Vista Murrieta High School dominated the Paloma Valley Wildcat Relays track meet Saturday, sweeping the top two divisions in both boys and girls competition against a field of 22 schools. The Broncos sent a message that their traditionally strong track and field teams are ready to be so again this season. The Vista boys easily won Division 1 with 140 points, far ahead of second-place Rancho Verde (74). Because of the strength of its program, Vista was allowed to enter a second boys team and that won Division 2 with 110 points, beating out Apple Valley (68.5). There was similar success on the girls' side. The Broncos won Division 1 with 128 points over Chaparral (75) and they won Division 2 with 103 points to Palm Springs' 89. "Vista and Chaparral have dominated this meet in the past," said Paloma Valley coach Bert Esposito. "This is the best boys team Vista's ever had." 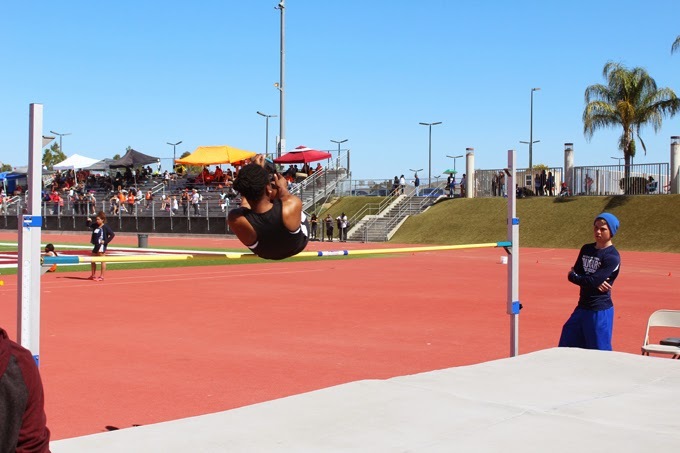 Besides dominating the relay races, Vista performed well in the field events, scoring victories in the Division 1 boys high jump, long jump and triple jump and the Division 1 and 2 girls long jump and triple jump. Broncos were also victories in the shot put and discus events. Host Paloma Valley placed fourth in boys Division 1 with 64 points and seventh in Division 1 girls with 47 points. For complete results, visit the Finished Results timing company's website here. 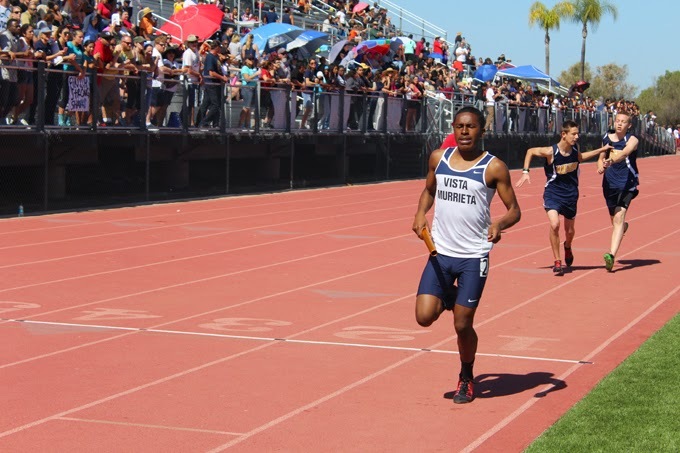 Christian Malloy crosses the finish line in Vista Murrieta's win in the boys 4x800 relay. 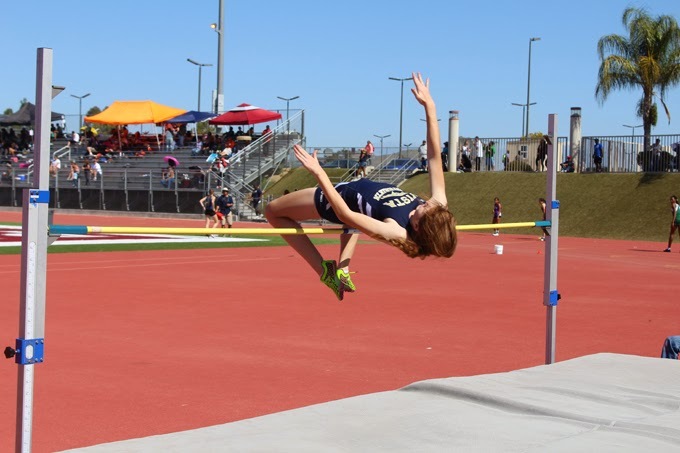 Vista high jumper Nicole Carmody clears 4-8 in the high jump. 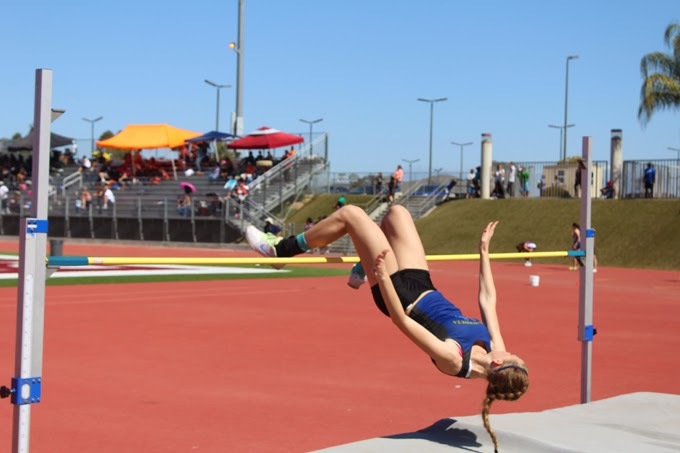 Delaney Lyons clears 4-8 in the high jump for the Broncos. Paloma Valley's Regina Sheffield has no trouble clearing 4-8 in the high jump.